(partial) Software Quality Assurance: Some thoughts on software quality assurance, K Frühauf. Quantitative assessment of safe and reliable software, B Runge. Modelling system quality, A A Kaposi & B A Kitchenham. 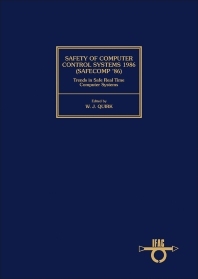 Programmable electronic systems safety: standards and principles, S R Nunns et al. Software Fault Tolerance: A recovery block model and its analysis, S D Cha. Diversity - some considerations about its benefits and limitations, F Saglietti & W Ehrenberger. Error recovery in multi-version software, K S Tso et al. Multi-version software development, J P J Kelly et al. Fault-Tolerant Distributed Systems: The joint algorithm: ordering messages in replicated systems, L Mancini & G Pappalardo. Protection of shared resources, F Malabocchia & L Simoncini. A proposal for distributed commitment and abort of multi-site transactions in a multi-microprocessor system, P Ancilotti et al. Safe and Reliable Architectures: Self-checking circuits: from theory to practice, M Nicolaidis & B Courtois. Knowledge Based Approach to Safety: Data base coherence: LRC language commutative convergence, J-F Hery & J C Laleuf. Man-Machine Interface: Toward fault-tolerant man-machine interfaces, R A Maxion. Design for Safety: Engineering software safety, W J Quirk. Reliability and Safety Assessment: Dependability prediction: comparison of tools and techniques, M Mulazzani & K Trivedi. Test and Qualification: Basic qualification concepts for instrumentation and control systems, F A Monaco. Author index. Subject index. For all those involved with the control and design of computer systems.